Unylogix also carries tape libraries / jukeboxes based on Mammoth 2 technology. Download the Exabyte Mammoth 2 Data Sheet in Adobe Acrobat® format . The AIT (Advanced Intelligent Tape) format is Sony's latest innovation in fast access high density tape recording technology. AIT forms the basis of Sony's new SDX series of tape drives and media. The ability to store large amounts of data and retrieve information quickly is critical in today's applications. Tape storage and retrieval has been revolutionized by Sony's award-winning Memory in Cassette (MIC architecture). The MIC consists of a memory chip built into the data cartridge which holds the system's log and other user-definable information. Applications that benefit from MIC's capabilities include hierarchical storage management, video server, film editing and real-time data acquisition. Unylogix also offers tape libraries / jukeboxes based on AIT-1 technology. The UNA-130 offers a native capacity of 50GB and a compressed capacity of 130GB, with a data transfer rate of 6 MB/second native and 15.6 MB/second compressed. Unylogix also offers tape libraries / jukeboxes based on AIT-2 technology. The UNA-260 offers a native capacity of 100GB and a capacity of 260GB, with a data transfer rate of 12 MB/second native and 31.2 MB/second compressed. Storage Capacity 100 GB native storage capacity, or 260 GB compressed capacity in a compact external or internal drive with a 31MB/sec sustained transfer rate (2.6:1 compression). More detailed specifications on AIT3 tape drive. The UNA-520 offers a native capacity of 200GB and a compressed capacity of 520GB, with a data transfer rate of 24 MB/second native and 62.4 MB/second compressed! Compatibility Backward read and write compatible with AIT-3 tape media. Backward read compatible with AIT-1 and AIT-2 tape media. Storage Capacity 200 GB native storage capacity, or 520 GB compressed capacity in a compact external or internal drive with a 62.4MB/sec sustained transfer rate (2.6:1 compression). More detailed specifications on AIT4 tape drive. 500GB/1.3TB S-AIT DRIVE NOW AVAILABLE!! 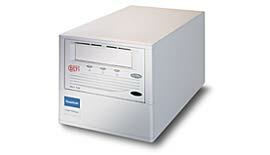 Packet technology makes this a high capacity, high performance and reliable tape drive. Interface SCSI, Narrow or Single-ended. Complete drive specifications Please click here. 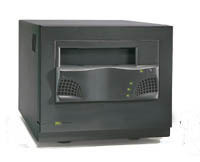 Unylogix VXA based tape units offer high performance/high capacity at a surprisingly low cost! Download the VXA Data Sheet in Adobe Acrobat® format (87kb). Unylogix also offers tape libraries / jukeboxes based on VXA technology. Twice the speed and more than twice the capacity of VXA-1 !! Building on three years of field-proven experience for VXA technology, VXA-2 brings and delivers the best value you'll find in a tape backup solution. Interface SCSI Ultra2, LVD, Single-ended. Download the DLT-1 Data Sheet in Adobe Acrobat® format . Unylogix also offers tape libraries / jukeboxes based on DLT1 technology. Unylogix also offers tape jukebox/libraries based on DLT-4000 technology. Unylogix also offers tape jukebox/libraries based on DLT-7000 technology. Unylogix also offers tape jukebox/libraries based on DLT-8000 technology. Unylogix also offers tape jukebox/libraries based on SuperDLT technologies. Unylogix also offers tape jukebox/libraries based on LTO technologies. Unylogix also offers tape jukebox/libraries based on 9840 technology. Total capacity for data compression units is based on the manufacturers' quoted data compression ratios of 2:1 for 4mm (DAT), Exabyte 8mm, Quantum DLT, SuperDLT and LTO Ultrium units, 2.6:1 for AIT and Super-AIT units, and 4:1 for STK 9840 units. Data transfer rate is also based on these assumptions. Actual speed and capacity is system dependent. 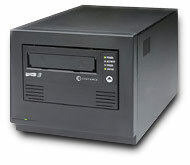 We also offer data interchange tape drives & tape jukebox. Click here for more information. We also offer Tandem Non-stop tape drives & tape jukebox. Click here for more information.